One of the club's most prized and popular items is the original Visitors Book, containing the names of many legends of the game. 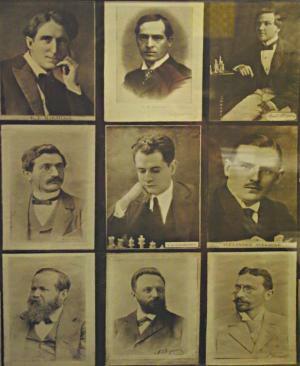 Amongst its pages are the signatures of many figures well known to students of chess history or readers of classic games. Harwitz and Lowenthal visited in the mid 19th century. Howard Staunton was at the relaunch dinner in 1852 and was an honourary member. Teichmann was here in 1893. There have been various British stalwarts such as Blackburne, Thomas, Yates and Sergeant, and overseas masters touring Europe such as Mason, while others who have become known for their support in areas such as chess publishing - any player who was brought up in the 50s, 60s,or 70s will know the name B.H. Wood for instance. Modern visitors have included the English GMs John Nunn and Jonathon Speelman, and we have a signed scoresheet from the American William Lombardy from his visit. Vlastimil Hort was here in 1980. Our own Scottish GMs are always popular visitors. Paul Motwani attended our 175th anniversary evening and has given a number of talks in the club, while Jonathan Rowson played for us while resident in Edinburgh a couple of years ago. But the most impressive of all, and the names everyone wants to see are those of the World Champions. The great Jose Raul Capablanca visited in 1919. The great Anatoly Karpov made a private visit to the club in 1984. In 2012 we had a visit from former World Champion Veselin Topalov who gave a simultaneous display against 20 players.